Selection » Paint Care » Wash & Clay Bar » "Clay" Cloth, 7"x7"
This new product is a 7"x7" microfiber cloth coated on one side with a revolutionary new rubberized polymer which will do the job of the clay bar - better - and with less FUSS! Kneading the clay bar into a fresh, cleaner surface is a thing of the past. Drop it and throw it away? ... NOT with the new products! Just rinse them off thoroughly and go back to work. Compared to the finger tip working patch for clay you get to use your whole hand to do the job. If you get 12 to 15 cars per 200 gram bar then you're being very efficient BUT the new products are capable of 50 cars, as advertised, and possibly 80 to 100! Now you noticed I mentioned "Products". There is more than one. You can choose between this 7"x7" cloth, a 12"x12" cloth, the "Clay" Mitt or one of the "Clay" Pads for DA or Cyclo (that is to say, in 6" or 4"). Save time, do a better job, save money and enjoy life with the latest Tech. About that money thing ... up front cost is much higher but, do the Math, 12 to 15 cars vs 50 to 80 cars for 2-3 times the cost. You have to have the volume but if you do, you gotta' have this stuff. NANOSKIN AUTOSCRUB System works fast and achieves professional results with a new advanced rubber polymer technology which replaces the use of clay bars. 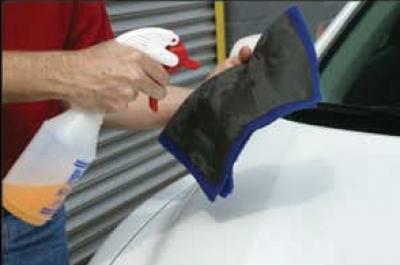 It safely and easily removes paint over spray, water spots, fresh tree sap, rail dust and other bonded surface contaminants from the surface of automotive paint, glass, moldings and plastic. Unlike the clay bar, the AUTOSCRUB can be cleaned by simply rinsing off the accumulated contaminates with water. If you should drop the AUTOSCRUB on the ground; just rinse the rubber clean and you're ready to go again. Unlike clay bars the AUTOSCRUB glides easily for sturdy and controlled handling. Constantl reshaping of clay is a thing of the past! *For surface prep = Use with NANOSKIN GLIDE Instant Spray Lubricant. *For ONE-Step Clay, wax, and seal = Use with NANOSKIN NANO SHOCK Hydrophobic Spray Lubricant Sealant. Cleaner/Activator. Then follow with RAIN Glass Sealant and microfiber towel. Use ONLY on clean, cool paint out of direct sunlight. DO NOT work on the surface over 144°F. Test in an inconspicuous place for the first time in case of unexpected adverse effects on paint surface. 1. Thoroughly wash vehicle to free surface of dust, sand, and dirt. 3. Mist sufficient GLIDE or NANO SHOCK onto the surface evenly. 4. Polish the surface with light pressure. 5. Wipe off residue and apply wax or glaze. - Sufficient lubrication is crucial to the AUTOSCRUB application. - Plain water is NOT an adequate lubricant. - AUTOSCRUB is not solvent resistant. protective sealant coming off. Don’t use until the polymerized rubber is soft and slightly tacky. Total Import Solutions is not responsible for the misuse of this product or if the product is used in any other way than directed.